Because luxury home buyers are highly informed consumers, PrecisionCraft tends to operate with a distinct advantage. This is because we offer Better Building Solutions using integrated products that provide your log or timber home with a complete, highly energy efficient building structure. This article focuses on these selected products and how they work together to dramatically increase the energy efficiency in your mountain style home. Radon Guard™ is a sub-slab depressurization panel. Naturally produced from decaying uranium in soil, radon gas is radioactive. It is important to remove the radon gas before it enters the home to ensure your family’s health. Radon Guard™ mitigates the radon gas filtration and allows for safe soil gas removal. It also provides a capillary break between the ground and the air barrier system. Additionally, Radon Guard™ offers a layer of insulation under the foundation. Since up to 25% of the energy loss in your home can come from your foundation / crawlspace, building with Radon Guard™ is also energy efficient. Watch a video about Radon Guard™ here. Insulated Concrete Forms (ICFs) quickly build foundation walls for our custom, complex footprints. 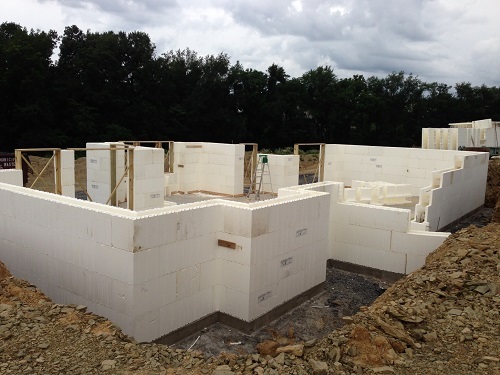 ICFs are molded expanded polystyrene (EPS) blocks connected with polypropylene webs and then filled with concrete. Building with ICFs assists concrete subcontractors to easily lay out your home’s foundation– exactly as drawn. Building with ICFs also removes a step from the building process because the required layer of insulation is part the ICF structure. When the EPS combines with the concrete inside, the provided R-value of ICFs is R-23.5. Contrast this to a typical fiberglass batt install of R-8.8. The higher the R-value, the greater the insulating power. Thus, your energy conservation is clear. 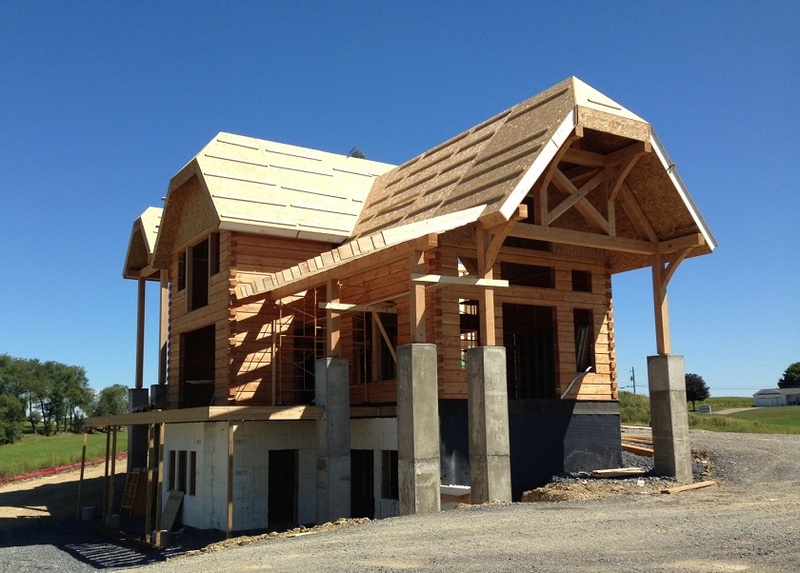 At PrecisionCraft, exterior walls that do not feature full log construction are built using Structural Insulated Panels (SIPs) manufactured by our sister company, Insulspan®. Insulspan is the only SIP manufacturer that has code listings for its SIP system in both the United States (ICC) and Canada (CCMC). 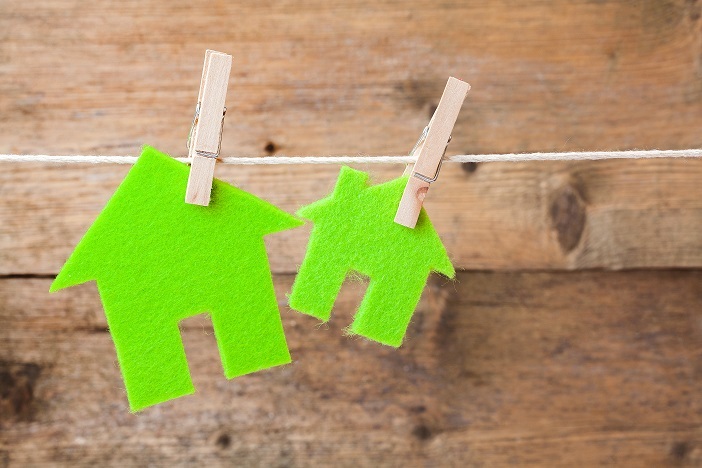 Insulspan SIP walls provide R-values reaching up to R-25.4. [i] Compared to a typical batt-filled wall performance of R-12.8, the savings quickly add up. SIPs also provide continuous insulation which greatly reduces thermal breaks created by stick framing and air infiltration. Consequently, SIP walls help reduce energy costs for the entire life of your home. With an estimated minimum of 25% of energy loss occurring through the roof of a home, a SIP roof is simply common sense. Further, continuous insulation reaches up to R-50, meaning SIP roofs are ideal for keeping conditioned air inside your home where it belongs. This is especially beneficial for the vaulted areas often found in our mountain style homes. Due to your tight energy-envelope, it is imperative that your home have a properly configured mechanical system (HVAC). PrecisionCraft commissions a Manual J to calculate the accurate heating and cooling loads for your home. We also include the Manual S (system selection) and Manual D (duct design). Adding these worksheets to your construction documents assists your builder and HVAC technician to install a system correctly sized for your home. Learn more about Manual J by reviewing a Manual J HVAC design review sample form here. From foundation to walls, roof to HVAC, our definition of a quality construction process always concludes with a beautiful home and an incredibly comfortable interior. It also includes a healthy living environment, and dramatically lower energy usage. Please contact our experienced professionals today to learn more about our Better Building Solutions.